The best villa or apartment in Sardinia south, convenient for exciting cycling trails and biking tracks. 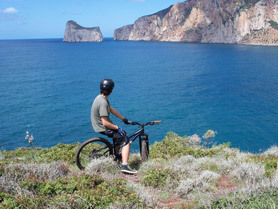 Bicycling and biking in Sardinia south west coast is a don't miss. Any kind of bicycle or bike at the rental facilities in South Sardinia. Or … bring your own bike for your holiday in Sardinia! Enjoy the natural environment while cycling or biking through the wonderful landscape of the sea with its beaches, cliffs and creeks. The true Sardinia, that of the south west. South Sardinia offers to the bicycle lovers fertile plains, gentle hills as well as steep, and paved roads overlooking the cliffs, always in sight of the blue sea and the Mediterranean maquis flowering oleanders, prickly pears, and yellow brooms. 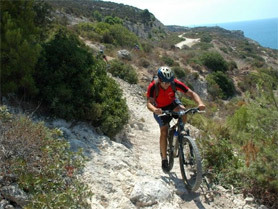 Sardinia south west also offers to the bike lovers tracks in the woods, or trails near the beaches and dunes of sand. 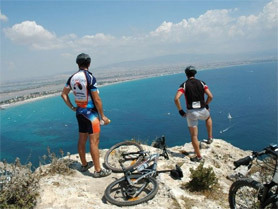 In Sardinia the cyclists andthe bikers, never leave the sea and sun. The island of S. Antioco is particularly suitable to be visited by bike. The paved roads run along the perimeter of the island, while the wildest trails meander toward the inside, then come out on a beach or look out of a steep cliff. Beautiful paved routes are those that connect Portoscuso, Gonnesa, Nebida, Masua, Buggerru, Fluminimaggiore e Iglesias. In Iglesia, Carbonia, Calasetta, Portoscuso, Carloforte and Sant’Antioco, there are many bicycle rental facilities, or “rent a bike", which will give you the maps of the best trails and routes. Many beautiful routes exploring the wild and romantic beauty of the south-west of Sardinia, between abandoned mines and deserted beaches, to savor every corner of this magnificent land. In the south west of Sardinia, an easy route for everyone that will let you know the history, traditions, architecture and beaches on this part of Sardinia, where rocky cliffs, secluded coves, islands and watch towers have as background the green coast and the crystal blue water of the sea. Suitable for everyone including families with children. We wish to tank for having kindly allowed the use of the photos the Ichnusa bike company, based in Cagliari, which offers a wide range of cycling tours across the beautiful Mediterranean island of Sardinia.